What secrets have the river's waters hidden for the past three-quarters of a century? Back in 1935, Ohio State University built a dam across the Olentangy River, just north of W. 5th Ave. The dam was to supply water for the university power plant. Backed up behind the dam, the river tripled in width as it passed through the campus area. In late 2012, the university and the city demolished the no-longer-needed dam. The river returned to its natural, much smaller size. Land on either side of the river that had been underwater for the past 77 years, saw the light of day again. 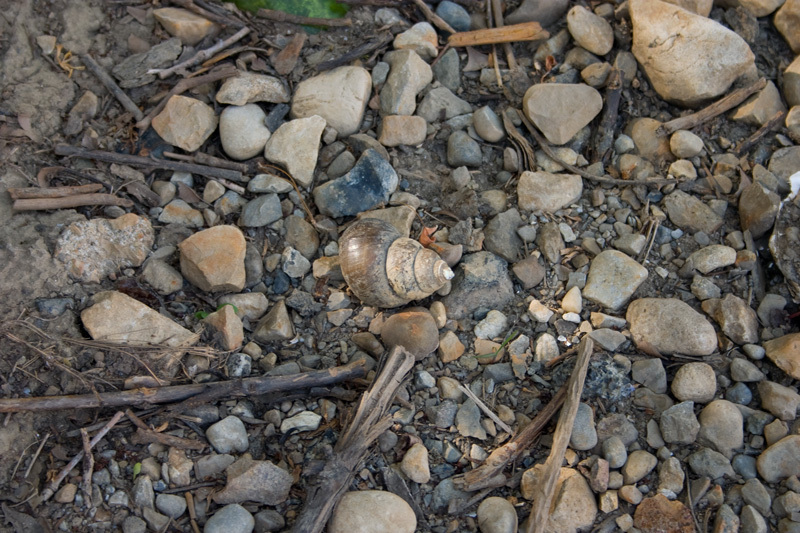 SNAILS AND MUSSELS- Many shells of large freshwater snails. Lots and lots of mussel shells, ranging from a centimeter or so all the way up to the size of salad plates. Surveys in recent decades have identified about a dozen species of mussels living in the muddy waters of the Olentangy. 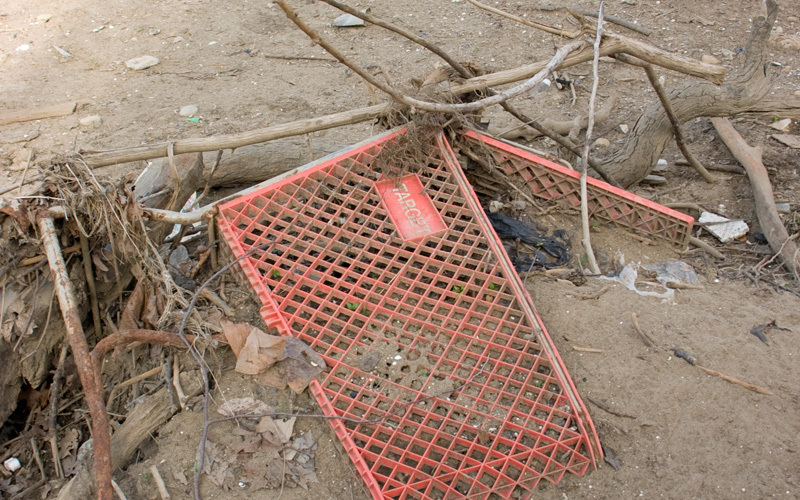 SHOPPING CARTS- There are nearly a dozen carts or pieces of carts. Several are red plastic carts of the type used by the Lennox Mall Target from its opening in 1996 until its remodeling a couple years ago. There are also metal carts in here of the sort used by more distant Kroger's and a couple really old. massively rusted ones that may have come from the Big Bear grocery that sat at 386 W. Lane from 1934-85. 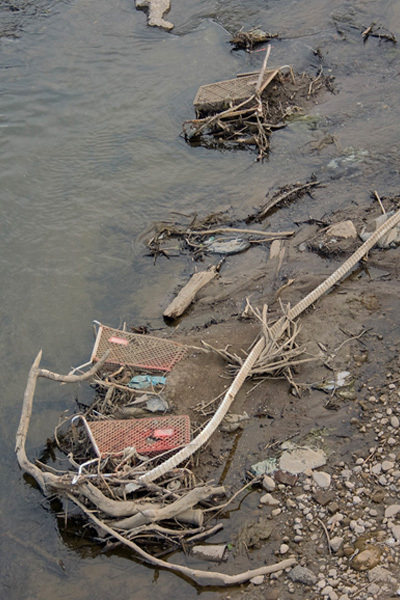 Somebody put some work into getting these carts into the river. Target is a mile away. The nearest Krogers are 1.18 miles (Chambers Rd.) and 1.19 miles (N. High at 7th) distant. The old Big Bear was about a mile north. 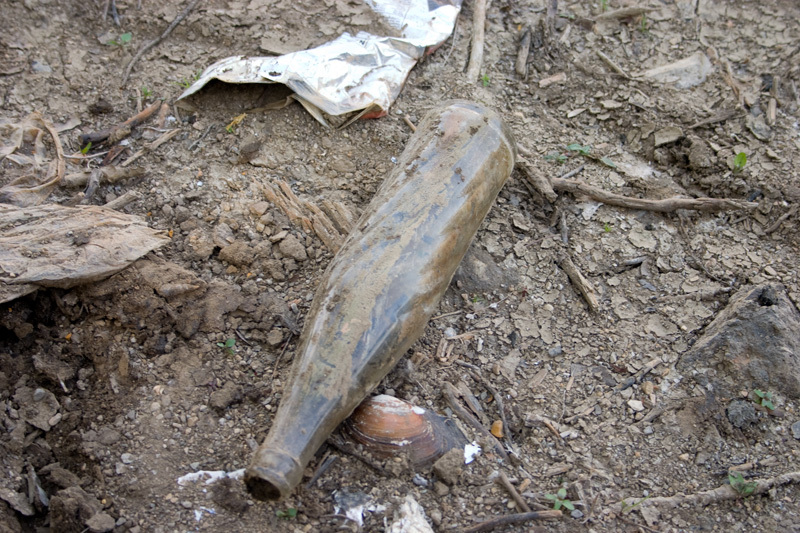 OLD BOTTLES AND CANS- It's campus so bottles and rusted cans are a given. It's no surprise that there are a lot of Natural Light cans. 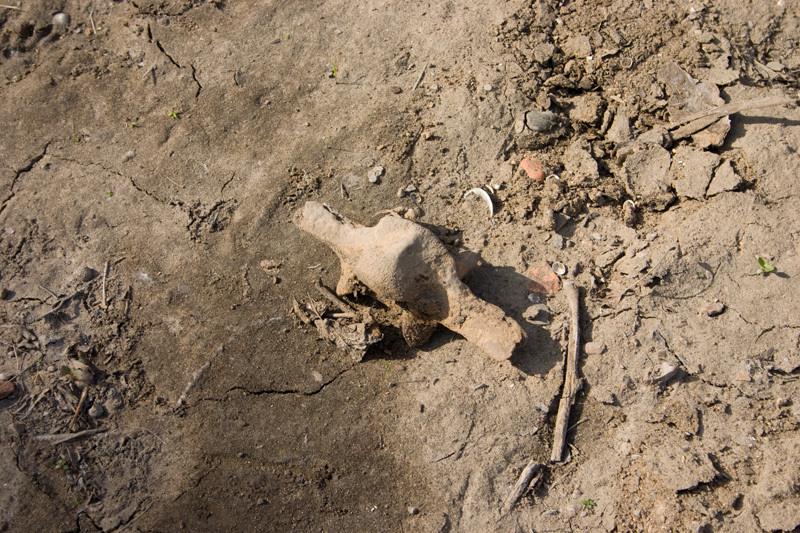 It is surprising how many decades-old bottles are intact in the sand and gravel of the old river bottom. This swirled design Pepsi bottle is a of a style used in the late 1960s. I also found an old Coke bottle of a design that was used from 1938-51. Saw a faded but still legible 1970s Mountain Dew can. Saw an old Blatz Beer can. When was the last time they sold Blatz around here? A SAFE?- What is this thing? It's a rusted steel box about 4' x 3' x 2' with wheels on the bottom. No apparent door but that could be on the side that's buried in the mud. 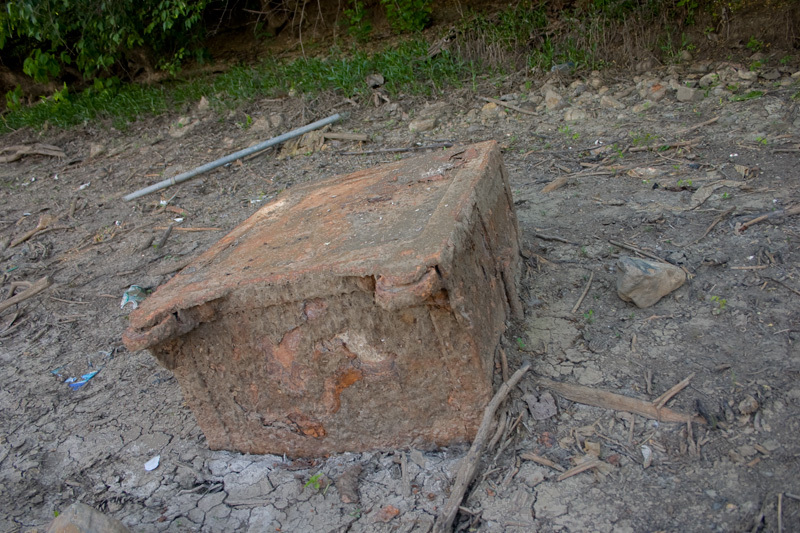 Where the steel has corroded away, you can see the box is lined with or filled with concrete. How did this very heavy object come to be lying in the Olentangy River. Who put it here and why? And, more importantly, what's in there? 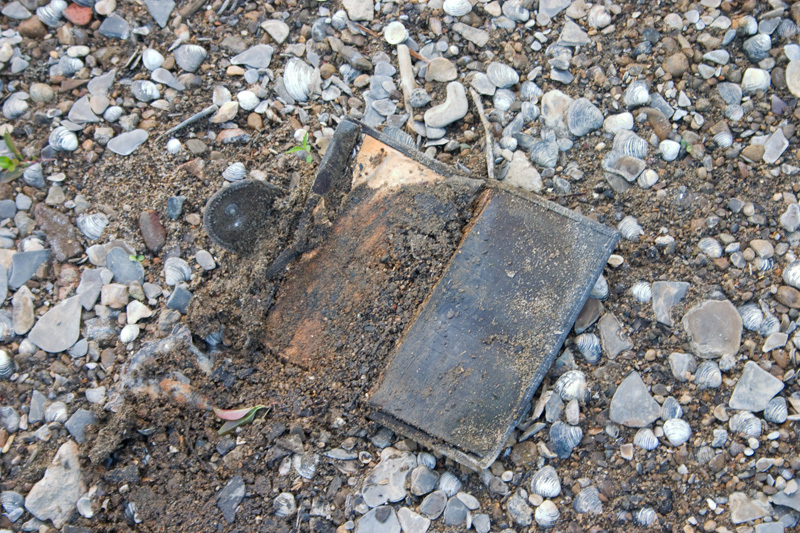 WALLET- Found a woman's leather wallet half-buried in the sand, gravel, and mussel shells. Styling suggested 1980s or early 1990s. I opened it up to see if there was a photo, driver's license, student ID, or some other identification inside but only found sheets of former paper (currency?, checks?) that years under the water had turned to foul-smelling gray-black muck. I wonder how it got here? Did its owner drop it? Did a thief throw it in the water after taking what he wanted from it? 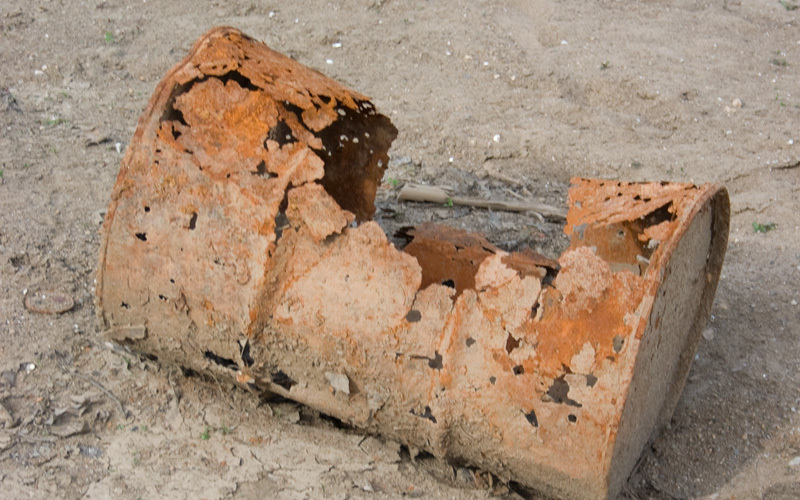 BABY-GROW-NO-MORE- There were several rusted-out old 55 gallon barrels of the sort used for industrial chemicals. I hope they didn't contain anything too awful. 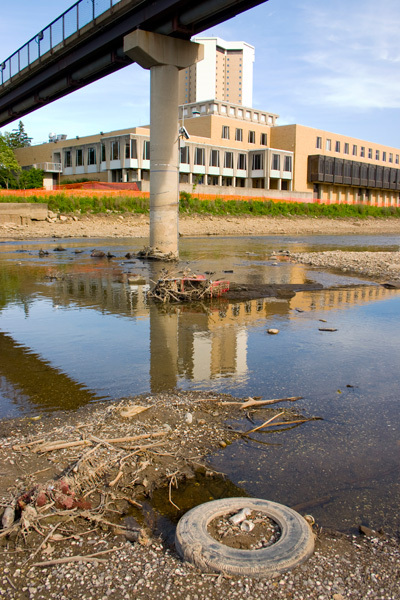 CONSTRUCTION DEBRIS- Chunks of concrete and twisted rebar, pipe, hunks of asphalt, bricks, blocks, and rotting 2" x 4"s are common components of the river bottom debris. This brick caught my eye. 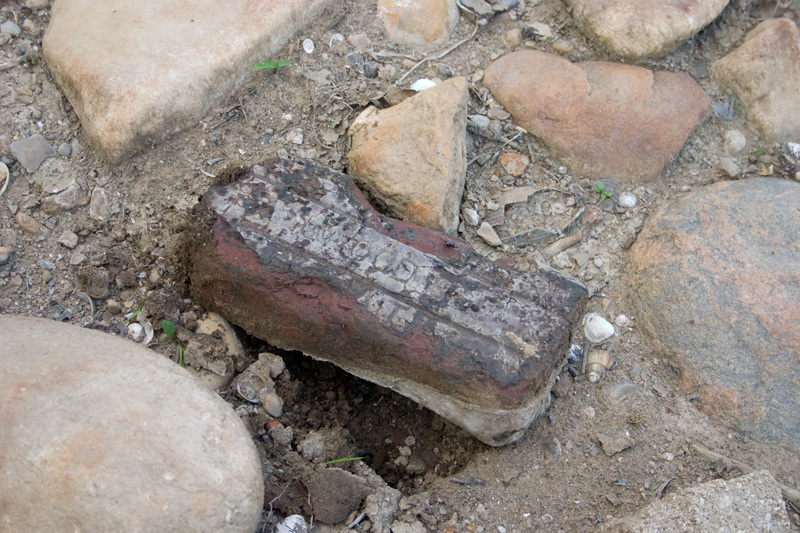 It's a salt-glazed paving brick of the sort made early in the last century. Similar "Nelsonville Blocks" underlay most of the streets around here. This one is stamped with the word "Hallwood." Hallwood refers to Henry Hallwood, a local entrepreneur who made a fortune in paving bricks in the late 19th Century. Hallwood's bricks were made locally and line the streets in older parts of town such as German Village. 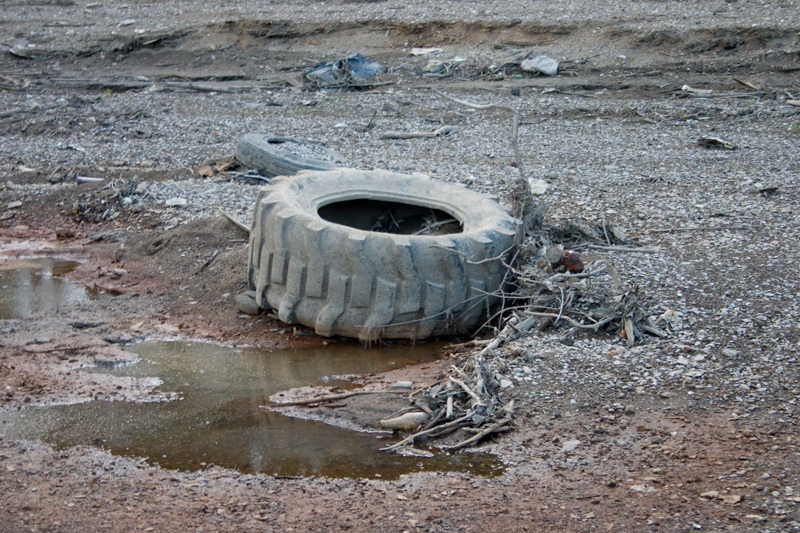 TIRES- A score or more of these. Every size and description, from bicycle to truck. This big tire from some sort of construction vehicle was unique, however. There were a few bicycles buried in the sand and gravel but fewer than I expected to see. 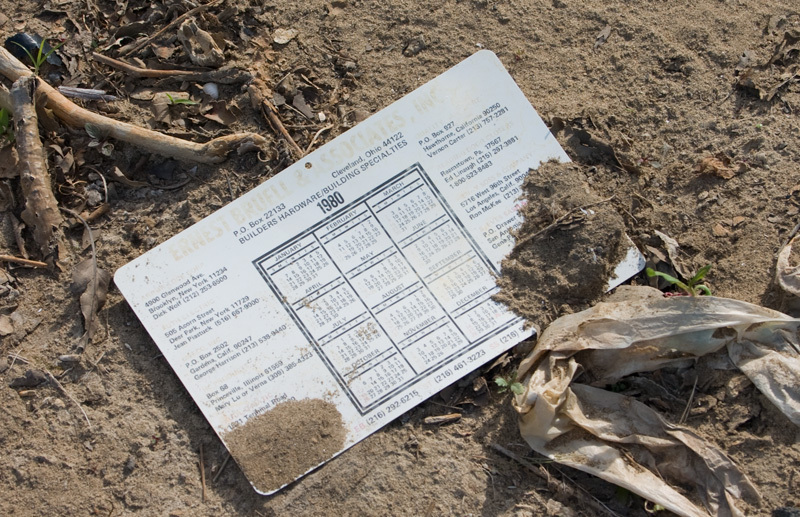 BONES- One big surprise was the number of bones on the river bottom. Here's some animal's vertebra. There were cow bones, pig bones, sheep bones, deer bones, and an awful lot of rodent skulls. Didn't see anything human but there was one deer radius that looked awfully suspicious. Started wondering if anything ever washed down from the old Ohio State medical waste dump that used to be up at Lane and Olentangy River Rd. a half-century ago. 1980 CALENDAR- This was a surprise. A plastic calendar from a Cleveland building supply company for the year 1980. 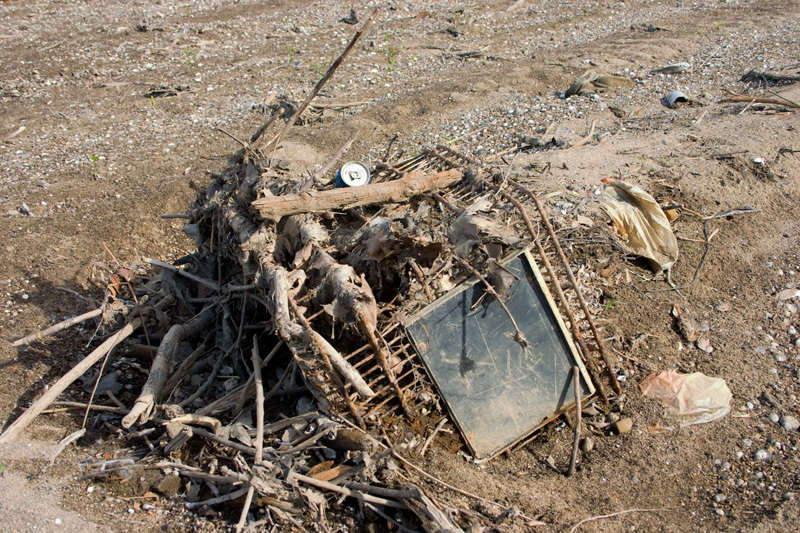 Somehow this got into the river and lay buried in the sand beneath its waters for the past 33 years. Plastic is forever. CRT- An old-fashioned computer monitor from back in the days of floppy disks and Windows 95. 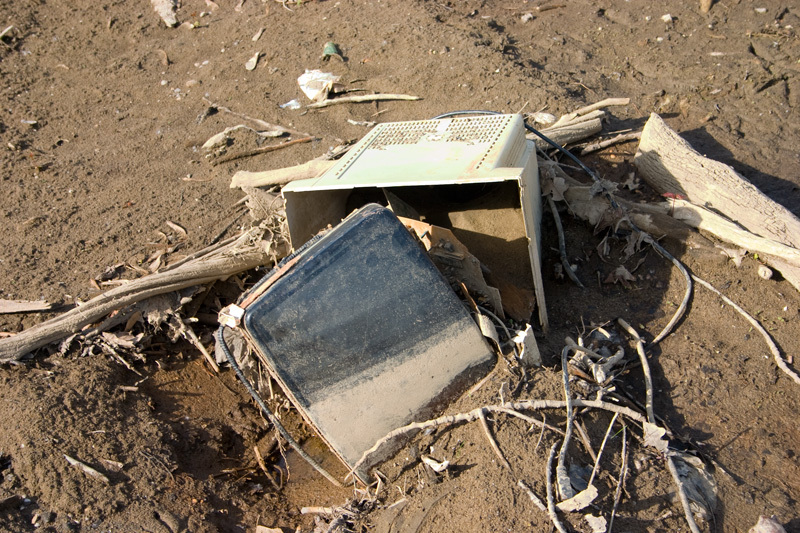 Computers at that time gave you a lot to be frustrated about but somebody must have been pretty mad to lug this heavy thing all the way down to the river and chuck it in. 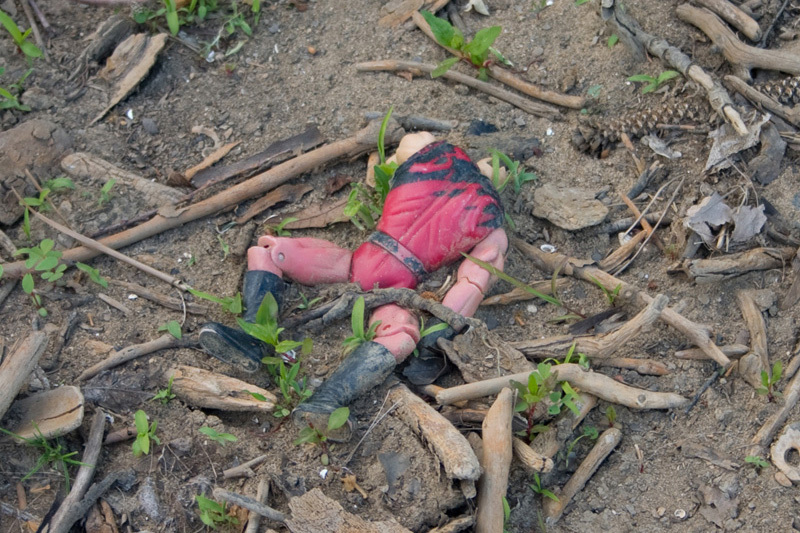 TOYS- A headless 1980s action figure, partially buried in the sand and gravel on the former river bottom. Hard to tell without the head if he was a Thundercat or part of He-Man's gang. If anybody knows, drop me a line. This is just the stiff that was lying on the surface. I'd be really interested to see what's buried a couple feet under the sand and gravel. Might be a great project for an Ohio State archaeology field school to undertake before the landscapers come in.